It’s true. Those friends still (lovingly) jibe me about my journey into politics. Prior to 2012, I was the one who barely talked politics and was often the first to shut down such discussions. A few months ago, at the height of the Cambridge Analytica scandal, I downloaded all of my Facebook data and reviewed some of the archived posts from that time. I barely recognise the person who wrote them. 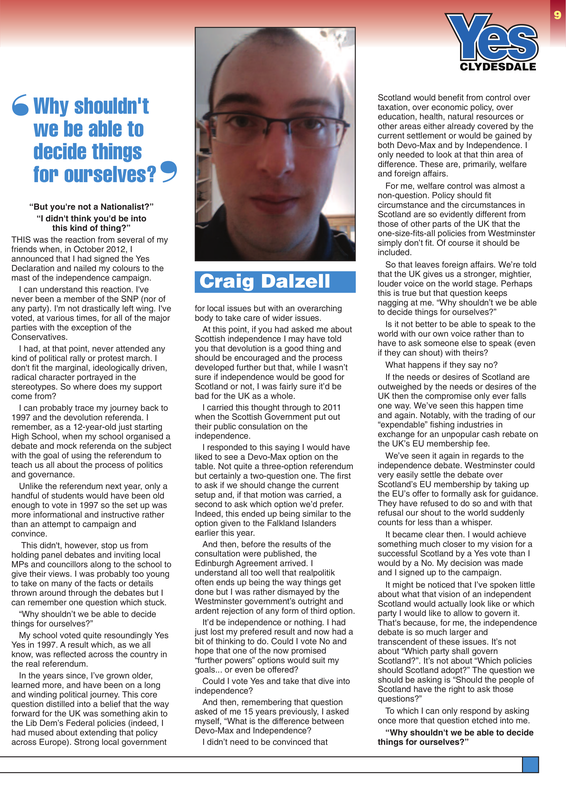 My journey to independence has been a profound one but it’s one that cannot be told without also telling the story of my journey to Common Weal because they go back almost as far. In January 2013 I attended my first “Yes” meeting in Lanark. This was my first political meeting of any description so when a rail thin, bearded guy with a cane and wild eyes started manically rattling ideas towards the room I, quite frankly, questioned what I had gotten myself into. That was the first time I met Robin McAlpine. I met him again the following month when my local campaign group Yes Clydesdale held their launch night. Second time round, I came away thinking that this guy was still a little out there...but he had something to say. That was my introduction to what would become Common Weal. It wouldn’t take too long for my thinking to evolve from “Scotland needs to be independent and these Common Weal ideas are quite nice”, through to “Scotland needs Common Weal ideas and independence is a step along the way to getting them”. Throughout the summer of 2013 I was out with Yes Clydesdale knocking doors and canvassing. I developed a rule for myself. Whenever I encountered a question I couldn’t answer I made a priority of getting an answer for the next time. Questions on currency, pensions and finance were – and still are – the ones most commonly encountered. And that was how this laser physicist started to learn about economics. By November of 2013, Yes Clydesdale asked me if I could contribute something to their monthly Aye Magazine. The opening paragraph of this article is copied verbatim from my first ever piece of writing on Scottish politics and marked the beginning of my tenure as a columnist there. It wouldn’t be long before they started throwing me in front of the public to answer questions at public hustings and other events. I’m writing this article on the four year anniversary of the referendum. I remember well the mix of emotions of that week. From the ecstatic carnival atmosphere, the nervous energy of the polling day itself and then, of course, the crushing void of the day after when the results were announced. It would have been easy, in that morning, to have hung up my political jacket and to have gone back to the “real world” again. But then I read an article from Robin telling us to “Wipe our eyes and get on our feet”. Like others, that was what I needed. I started writing again. I resolved to get even more involved in politics. I soon took the opportunity to do so by backing Common Weal’s first fundraising campaign. My blog came along a few months later and it was through that that I caught the attention of Common Weal via an article I wrote examining that year’s GERS figures (which, incidently, began the process of getting folk more interested in scrutinising public accounts and everything that has happened around GERS since then). Common Weal brought me in as a volunteer researcher then later, after another successful crowdfunding campaign, brought me in as a member of staff and subsequently made me their Head of Research. As I say. It has been some journey. I hope it is a reflection of how important I personally feel that Common Weal have been in playing (and are continuing to play) in shaping Scottish politics. They, we, are at the cutting edge of bringing inspiration and radical ideas to the Scottish political landscape and thousands of us have felt the impact of that in our lives. They’ve certainly made an unimaginable impact on my own. We are not a “normal” think-tank. We don’t have the backing of government grants, corporate sponsors or rich benefactors. We don’t even have adverts on our website. Common Weal is instead funded by you. This is our strength. We’re beholden only to those who share our vision for a better Scotland and I can already see where and how we’ve made a difference. The team I work with are some of the best in Scotland but to keep us together, we need to make sure that we’re sustainable in the long run. We’re not in this for the money. Believe me, if I was that mercenary, I’d be in a very different place right now. But in order to keep my team together and working towards the mission that drives us and in order for us to expand and do even more than we somehow manage to publish right now we need your support. This is why we’re particularly asking for regular, monthly contributions from those who can afford it. By matching our current average contribution of £10 a month (or £5 or whatever you’re able to give) you give us the ability to plan and to fight long-term campaigns. The last several years have changed my life in ways I couldn’t have imagined or believed. I’m now in the position to help change Scotland just as profoundly. I want you to join me as we take the next steps in our journey together.